Many important events happened in 1975. OPEC raised crude oil prices by 10 percent, Margaret Thatcher became the leader of the Conservative Party in the UK, the war in Vietnam came to an end and construction on the Trans-Alaska Pipeline System began. That same year, Martin Stark went to work for Aramco in Saudi Arabia as a Project Engineer. Having lived and worked previously in Libya for seven years, he made the move eager to continue traveling internationally and work on interesting construction projects. His spirit of adventure made him a perfect fit for the Aramcon culture. Marvin met his future wife -- “the lovely Ruth” in his words-- in Abqaiq where she was working as a nurse and midwife. They were married in Scotland by her father in the very church where he served. During his 21 years with Aramco, Marvin saw his wish for more international traveling fulfilled, spending time working on assignments in Tokyo, Yokohama, London, Jeddah, Ras Tanura and Houston. While living in Ras Tanura, Marvin learned to sail, working his way up club ranks from Vice-Commodore to Rear Commodore to Commodore. Not surprisingly, sailing became his favorite hobby in retirement. Upon returning to the United States, the Starks immediately made their home in a boat in California. Later they bought their first big Catamaran in San Tropez, France. From there, they spent the next six years sailing it throughout the Mediterranean, across the Atlantic, up to Maine, on to Panama and finally back home to San Francisco. 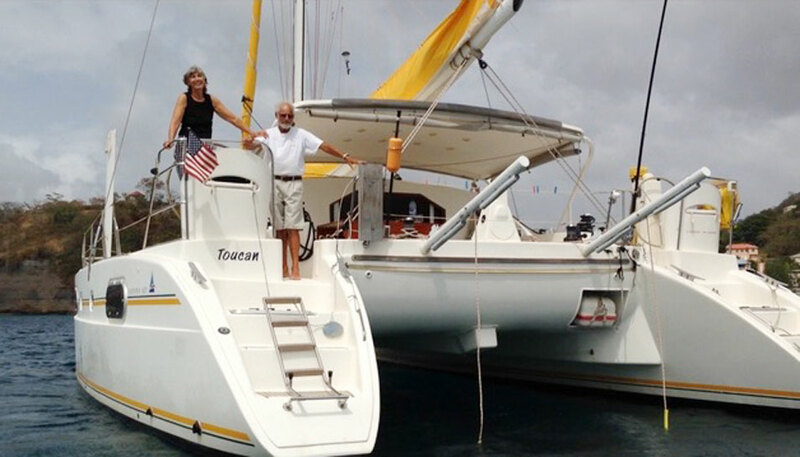 Always ready to embrace new adventures, a few years later they bought another boat in Malaysia. More recently, they purchased their present boat in St. Martin. Over the years, several Aramco retirees have sailed with Marvin and Ruth across various stretches of the seven seas. Marvin, who will turn 80 later this year, declares that "Enough is enough! I'm going home to garden.” That almost sounds like retirement! It should give Marvin and Ruth more time to spend with their four grandchildren, Brianna, Landon, Kristen and Allison. After all, their first duty as grandparents is to spoil their grandchildren. That’s certainly what most Aramcon grandparents I know do. And, while we commend his proposed dedication to Mother Earth, we hope that Marvin will find time to write more of his sailing stories, like those he has written in the past. If you visit their website, www.toucansail.com, you will learn much more about the Starks’ sailing adventures and Marvin’s writing skills. Marvin and Ruth encourage the former friends from Aramco to get in touch with them.